We’ll meet you at the cross-section of user experience and technology expertise. Many of the world's top brands have chosen GlobalLogic to help them design and deliver innovative products. Here are just a few examples of our delighted customers. As technology progresses and security becomes an increasingly important issue — especially for mobile devices — companies are relying on innovators like Qualcomm to develop secure solutions for telecommunications products and services. Building on previous successful collaborations, Qualcomm engaged with GlobalLogic to develop a prototype application for the company’s new Snapdragon Sense ID ultrasonic fingerprint recognition system. Qualcomm’s Snapdragon Sense ID utilizes ultrasonic technology to penetrate the outer skin layers of a user’s finger to detect unique characteristics such as fingerprint ridges and sweat pores. By creating a 3D map of a fingerprint rather than the flat images captured by today’s commonly used capacitive sensors, Snapdragon Sense ID system makes it extremely difficult for someone to copy a fingerprint and break into a device. 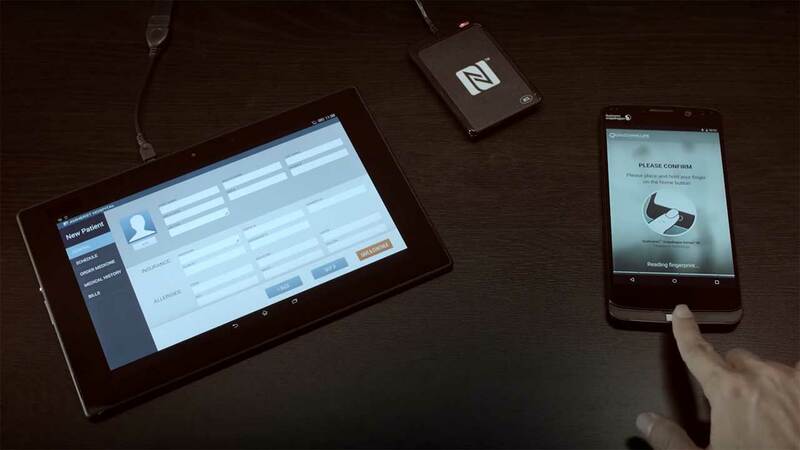 GlobalLogic leveraged its experience with rapid development on mobile platforms to create an Android application that demonstrates how Snapdragon Sense ID can be used in a healthcare setting. The application integrates with the fingerprint recognition system to authenticate a mobile device user’s identity and wirelessly transfer their insurance information to a clinic or hospital. Snapdragon Sense ID utilizes FIDO Alliance UAF integration to enable both secure online transactions and access to applications and data without passwords. The GlobalLogic Android application leverages encrypted near field communication (NFC) technology to securely transmit confidential information to a physician assistant’s terminal. GlobalLogic designed, developed, and implemented the prototype application in a very aggressive timeline of two weeks in order to launch at the Mobile World Congress. Since the Qualcomm engineering team was developing Snapdragon Sense ID’s SDK in parallel to GlobalLogic’s efforts, our team remotely built the application scaffold in the first week and then traveled onsite during the second week to integrate the application with the SDK and complete end-to-end interactions. GlobalLogic launched its healthcare application in the required timeframe, enabling Qualcomm to successfully demonstrate Snapdragon Sense ID at the Mobile World Congress. The combination of Qualcomm’s fingerprint sensor and GlobalLogic’s prototype application illustrates exciting new possibilities for the healthcare sector. By utilizing mobile devices reinforced with advanced authentication systems like Snapdragon Sense ID, patients will soon be able to securely transfer and receive confidential health information like clinical test results, healthcare benefit information, consultation with specialists, and remote patient care and monitoring.